KOKOMO, Ind. — Sarah Ferguson gives expectant mothers the first looks at their babies' faces, using technology not often available to medical imaging technology (MIT) students. 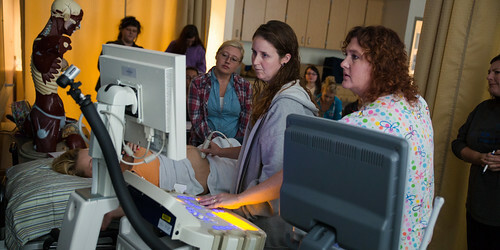 Diana Mishler uses hands-on experience to teach students how to use the new 3D and 4D ultrasound equipment. Ferguson, a senior in the Indiana University Kokomo MIT program, is one of the first students learning to use the campus's new 3D 4D ultrasound machine, in a lab that opened this summer dedicated to the program. "We'll be ready to enter the workforce at a level above what you can get at other schools," she said. "Having experience using this technology makes us more marketable. You don't get this kind of experience at most schools." Diana Mishler, clinical assistant professor and MIT coordinator, said the 3D 4D ultrasound is something students previously learned when they did their clinicals, which limited how proficient they could become with the technology. "This is not something many programs are able to offer," she said. "It's a big deal to give them this kind of access to this technology. You only have a limited amount of time in clinicals, and that doesn't give you the opportunity to practice and become skilled in it. Now we can give our students that hands-on experience." She is grateful to have the tools to prepare her students for successful careers after graduation. "These are the medical imaging professionals of tomorrow, who are going to say, 'I already know how to do this,' because of what we can offer in our program," she said. "Not everybody is going to have that experience, and those who have more experience are going to stand out when they seek employment." Previously, the MIT program shared a lab with the radiography program, but growing enrollment meant it needed its own space. The campus remodeled a former computer lab to create a lab for the students to study and practice using the technology demanded in their chosen field. During summer classes, students performed prenatal ultrasounds on volunteers, learning how to manipulate the machine to produce the best images and assess the babies' growth and health. Ferguson, who is from Tipton, learned that though most people think of prenatal care when they think of ultrasound, it is a tool with many uses. "You can scan all of the abdominal organs, vascular systems, check blood flow, and examine the thyroid, and see the gall bladder," she said. "It allows us to see all those organs without exposing the patient to radiation." She expects having this equipment at her fingertips means she will gain more skills in using them. "It allows us to get more practice than we would otherwise," she said. "Having all this so readily available is something you don't get in other programs." Beth Kronewitter likes being able to use the ultrasound machine outside of a hospital, where she is freer to ask questions than she would be in front of a real patient. "It's nice to have someplace on campus where we can practice scans, and not have to wait until we're in a hospital," she said. "These ultrasound machines are what we will use as professionals in this field. When we graduate, we can put this on our résumés, which is a huge advantage when we look for jobs." Kronewitter, a Lafayette resident, added that being able to use the lab for practice also helps her learn anatomy, an important part of her education. "It gives you another way to look at it, and see what it really looks like, rather than looking at a drawing in a book," she said.